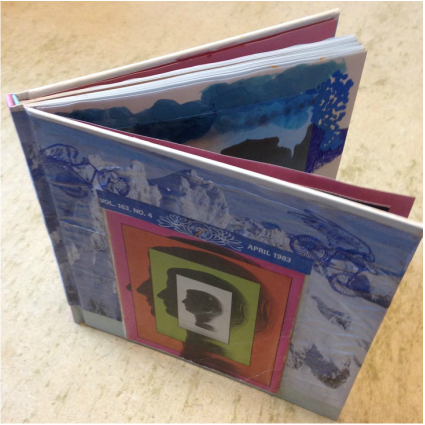 The Altered Book: Exploring Change, Time & Transition through creative processes. $100 per person. This workshop is intended for teens ages 11-17 year-olds. Space is limited to 4 participants. Deposit of $25 required to hold spot. Deposit non-refundable after 6/11. This three hour workshop is for those of us who need some reflection time and reprieve during the holidays. This workshop is meant for those who wish to practice relaxation while doing some self-reflection during the darkest times of the year. Using fine art processes including collage, drawing, painting ect, we will create altered books in which time is explored through the reflection of the self. Use this time to reflect on the year past and the year to come, or just use it as a time to relax and take a break from the holiday stress. All supplies are included, though you are welcome to bring in any books or other materials you wish to alter/incorporate. This is a therapy workshop; work and content created during this time may be personal, sensitive and inspiring. Be prepared to connect, learn and share within the space created.